First day back at Superweek for the Panther team was a tough day. It was the return to the “Historic” Milwaulkee lakefront road race course. The course, which has been absent from Superweek since 2005, is by far the best road race course that I’ve ridden yet. Starting right on the lakefront drive, the course starts going south towards the city, then making a sharp right hand turn climbing up into a rich neighborhood, then descending back to the lakefront drive. After following the lakefront drive the course again took a left up and away from the lake up into a park. At the end of the second climb the course winds through the park through first a parking lot, then a bike path for a short while then another parking lot before going back onto a slight downhill on the lakefront drive to the finish. Greg and I were the only Panther guys racing today, Derek took the day off to hand up bottles for the 130 Km race. Joey also experienced his first superweek race in what was a really tough day. Since road races are double points no one fast took today off. Being on the lake the course had a wicked wind blowing across the course. Once the race hit the flats that ran along the lake shore it was gutter city. In the second lap I tried going across to a large move that looked pretty promising, after chasing for the better part of a lap me and the ISCorp guy I was bridging with connected with what looked like the day long breakaway. It went well for a lap, then we got caught. I was pretty fried and dropped back in the field and got on the wrong side of rather small field split, so it was back to front just in case. It worked out well and I ended up in the second group of about fifty riders with fifteen up the road. It was pretty stop and go with a few more field splits along the way. The group got down to about thirty by the end. To the end of the 140 K race the group was getting pretty lax, with an unnamed pro waving and ‘holla’ing at girls running along the beach. We caught a few riders who got dropped from the lead group and ended up 21st. This turned out to be a good choice. Friday Joey and I drove down to Chicago to pick up Ashley who took the Amtrak to hang out at Superweek. Friday was the Kenosha kilometer. The course was right up my alley, no brakes through the corners, which were pretty much banked. 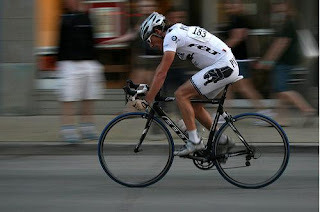 Paul Martin joined our Superweek trio for Friday and the remainder of the weekend significantly strengthening our ranks. I made it into a small break with one of the Taiwanese riders after a prime, we got absorbed by a larger group with some serious firepower and stayed away for a total of maybe fifteen laps. When we got brought back I took it easy in the pack for a while, meanwhile four riders got away to lap the field, followed by another twelve breaking off the front. However once the four leaders lapped the field those who didn’t want more riders a lap up decided to bring the twelve man group back. This was about the same time it started raining. This didn’t stop the field setting some of the fastest lap times of the entire day. The group of twelve got brought back and it was down to a field sprint. 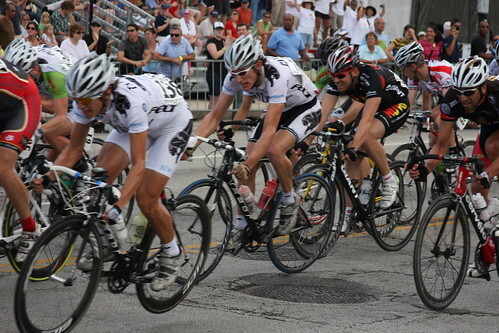 Being able to be at the front of a field jockeying for position at the end of the race is one of the most fun and exhilarating part of bike racing, and Kenosha was defiantly a blast. It had stop raining and dried up by the end of the race, that didn’t stop a second to last lap crash taking down a bunch of riders. I made it around intact and finished 11th in the field sprint. So since this blog post is getting long I’ll abbreviate the rest, that and my legs gave out for the rest of the series and I wasn’t riding all that hot. 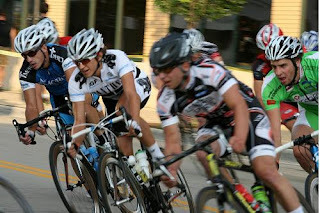 Chicago Crit: Twelve days of racing in Sixteen days is not good preparation for an NRC crit…end of story. Plus I flatted last lap, busting a $40 tubular tire. And Derek looks like he might die or something at any second.